Lightweight Protection: Stone shield constructed with energy dispersing molded panels / Level 1 ba.. Unique Construction: Pressure fit molded comfort liner system provides a smooth inner chassis for ma..
ΘΩΡΑΚΑΣ ΠΡΟΣΤΑΣΙΑΣ THOR SENTINEL S14.. 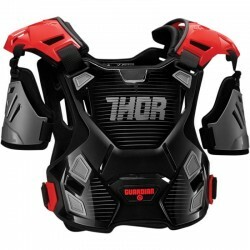 The ultimate under-jersey deflector is designed to offer maximum coverage, yet hug the body Micro-me..